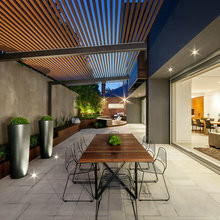 47 Projects for Solda Pools Ltd.
14 Reviews for Solda Pools Ltd.
We had the pleasure of partnering with Solda Pools on a recent outdoor kitchen project. This was our first shade project with Solda Pools. From the onset their team was professional, punctual and knowledgeable. Through the specifying stages they asked quality questions, ultimately deciding to go with one of our new shade structures. The end result turned out fantastic! We highly recommend Solda Pools, they have a great team and it shows in their final product. Great working with you, look forward to future collaborations. Our experience with Solda pools has been outstanding and beyond our expectations! The initial process begins with meeting with the design team who took the time to understand what our requirements were.Over time we changed many aspects of the initial design and Solda Pools demonstrated patience with us. We found that the construction team lead by Andrew Solda, very efficient ,prompt, professional and courteous. Andrew was always available to respond to our questions and requests. One of the main reasons why we chose to use Solda Pools for our backyard oasis was the fact that all the aspects of the construction was managed in house (i.e. decking,railing,landscaping and lighting..) It was very helpful to have one experienced company to deal with under so much pressure. We also decided to have them service our pool and spa weekly. The service team are very knowledgeable and professional. We recommended Solda Pools to our friends who have also decided to use them. In summary, go with Solda Pools and you won't regret it!! Solda Pools promised to build our inground pool within 5 weeks. The project was completed in 5 weeks. Their staff displayed a professionalism like we had never before. Their team of workers was efficient and knowledgeable, every aspect of the project was planned and the result was identical to those plans. They did an incredible job, cleaned up our driveway every day before leaving, were extremely careful with our neighbor's property, and everything ended up looking beautiful. We would recommend them to anybody who wants a clean and perfect project delivered. Hello Mary, Thank-you for sharing your experience. We enjoyed working with you on transforming your backyard into your Oasis. It looks amazing! Our family has always been impressed with Solda Pools. We have had two pools designed and built by the crew at Solda. From design, construction, quality and service, the staff at Solda have always delivered as promised. They are always professional, knowledgeable, considerate and helpful throughout. Solda has serviced the pools we have had and they are always available to assist and take care of the product they stand by. We would highly recommend Solda Pools and service to anyone looking for a quality pool company. Hello Becky, Thank-you for the referral. It was a pleasure working with you. Wishing you a wonderful summer of enjoyment with family and friends in your backyard oasis. Building a custom built home is a stressful and time consuming process for any family. Beyond your daily routine of managing kid’s schedules and dealing with demands of our careers, the home building process puts you in contact with a new set of personalities and expectations to manage. The stress is derived from not knowing where each path will lead you and how the end result will be achieved on time and on budget. This being said – the team at Solda Pools managed our landscape and pool building process in a stress free manner for my entire family. From the quoting process with Frank Solda through to the detailed execution process with his brother Peter Solda and everyone in between, nothing was missed and cost effective solutions were provided along the entire process. Our project was unique and had specific grading expectations dictated by our local municipal engineers. Extensive work was completed on the property including a concrete pool and pads, hardscape, fencing and the managing of drainage on a property with a high water table. Peter and his team managed the process flawlessly and went above and beyond our expectations. The years of experience and professionalism carries through to the entire staff and you soon realize that you are not just working on a project with a family business, you are part of that family for a short time. Everyone on the team made suggestions and offered insights that were only positive and it is exactly what you need when you are managing the other details of a custom home build. Further to this, they delivered on what they said they were going to deliver on with respect to costs, timelines and quality. 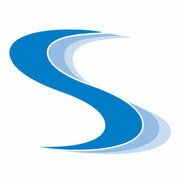 The team at Solda Pools was responsive, responsible and honest and we would highly recommend them for any project. We now feel like we are on vacation in our own backyard. Thank-you for the referral. It was a pleasure working with you to create your backyard vacation. I hired Solda to install a pool, cabana and landscaping. From the layout to completion stage, they were professional, courteous, clean and great to deal with. Every employee that showed up to my house was the same. The job was done ahead of schedule, on budget and all extras (due to extra work I wanted done), was conveyed and agreed to ahead of work starting. I highly recommend Solda to anyone looking to install a pool. Thank you for the review Tom, it was a pleasure working with you too - we take pride in both our work and our professionalism. 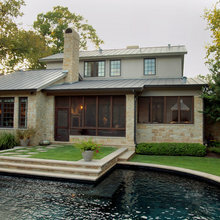 Once we decided to landscape and build a pool we only met with one company and that was Solda Pools. We were so impressed with their professionalism,proposed timeline, and the fact that they don't use subcontractors that we put a deposit down immediately. From our initial design meeting with Frank and Emily everything was what we envisioned and even when we ran into a small hiccup with the city permit Solda pools promptly altered the design to meet with the city requirements not causing any delay to us, and in the end a better plan than the original. The construction phase under the supervision of Nick and Peter was no different. Again, all the workers were prompt, professional, and pleasent. The days work was always completed and at the end of the shift the yard was cleaned up and the safety precautionsaround the equipment was ensured. On the weekends they cleaned everything up so well and boarded up the backyard which we really appreciated. Again, we ran into an inanticipated problem with an existing tree and the way the team at Solda dealt with this was amazing. They offered us a solution and executed it immediately which again in our opinion made the final product ethically better. Lastly, working with Andrew and John on the landscaping, cabana, and getting the pool functioning and open was seamless. The project was completed on time and the final outcome was exactly what we evisioned and even More so. We use Solda for maintenance and open/close as well and like all our other experiences they are professional, on time and very helpful. We are fisttime pool owners and had lots of questions throughout the summer and they answered everyone pleasantly. This was our first major construction project and the experience thanks to the team at Solda was positive. We are now lifetime Solda customers and have already recommended them to many people and wouldn't hesitate to do so in the future. Thanks to Nick, Andrew, Peter, John, Frank & Co. for our dream backyard oasis. Thanks for the review Jerod & thank you for choosing us to build your landscape. Hope your having a great time in the pool! Thank you for the kind review Rosa and Fernando, customer service is a priority for us at Solda Pools & it was a pleasure working with you. 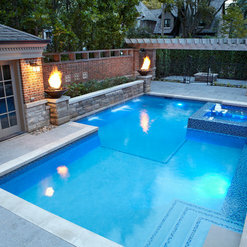 Last year, Solda Pools designed and built a beautiful backyard oasis for our family. Their attention to detail: from the initial design layout, to getting the project done efficiently and precisely was impressive. Their level of professionalism was clearly evident during our meetings throughout the process and they completed the project ahead of schedule. Not only was their entire staff knowledgeable and experienced, they were friendly and were happy to address all our questions. Since then, we have received numerous compliments from our neighbours. 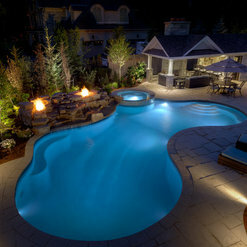 I'd recommend Solda Pools to anyone looking to build a beautiful backyard getaway. Thank you for the kind review Darlene - it was a pleasure working with you & we are thrilled to hear how many compliments you are getting! Solda completed our pool in May 2015, having started the construction process in December 2014. We were impressed by the entire Solda team from start to finish- respectful, reliable and professional. On time and on budget. Best of all is that the entire construction process is carried out by Solda- no sub-contractors used. Our backyard has truly been transformed into a beautiful oasis. No hesitation at all to recommend Solda if you want to have a well built pool. Thanks for the review Alison - the pool is looking great! The Solda team built us our beautiful back yard oasis last Summer. We can't say enough positive things about the company and our Project Manager, Nick Solda. We moved in mid-June and they had us swimming in August. They pulled out all the stops so that we were ready for our house warming party. They were a pleasure to work with, and their team is professional and courteous, and produce a high quality product. The whole process was easy because of them and we couldn't be happier with our pool. Five stars! Thanks for the review - we always love a challenge & its great to hear that its so well used! They were quite professional's and helpful in designing our project. They have a large construction team and therefore they don't use 3rd party constructors. The maintenance and service team is also very good. Thanks for the review Mehmet - the pool is looking fantastic! 14 Ideabooks for Solda Pools Ltd. 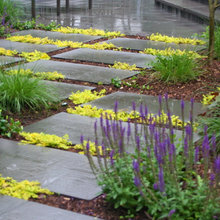 Commented: Is the coping colored concrete or stone? What color is it?This pool has the black granite stone coping. Commented: Hi! Wondering what color of waterline tile was used in this pool?This tile is the Sabi Sabi colour from the Lodge line through Daltile. Commented: Pool DimensionsThis is a free form gunite concrete pool 24' x 39'. Commented: what is the color and finish of this concrete?Black granite stone coping with platinum grey acid etched deck. Reef liner. Commented: what is the finish and color of this concrete?color of liner?Black granite stone coping with Limestone acid etched deck. Reef Liner.